Isn't funny how your old boyfriend turned out to be a stalking wackjob? Pretty Little Liars Season 4 Episode 19: "Shadow Play"
Who sharpened your tongue, little girl? Permalink: Who sharpened your tongue, little girl? Permalink: Em, get real, this is all about the A-ness of things. 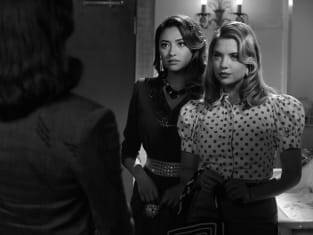 Pretty Little Liars Round Table: "Shadow Play"
Pretty Little Liars Music: "Shadow Play"